Among them, he says: Who will provide security, services needed by Afghan people? WASHINGTON (CNN) -- One of President Obama's top advisers said Sunday the Bush administration failed to ask critical questions about the war in Afghanistan, leaving the Obama administration starting from scratch -- and leaving the war "adrift." White House Chief of Staff Rahm Emanuel says President Obama is asking new questions about Afghanistan War. 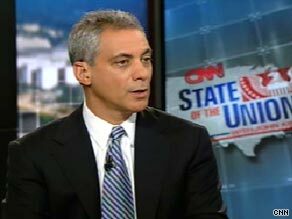 "The president is asking the questions that have never been asked on the civilian side, the political side, the military side and the strategic side," White House Chief of Staff Rahm Emanuel told CNN's "State of the Union." Among the things the Obama administration wants to know from Afghan leaders: "Do you have a credible Afghan partner for this process that can provide the security and the type of services that the Afghan people need?" The United States faces "a much more complex decision" than just determining the appropriate level of troops, Emanuel told CNN chief national correspondent John King in a rare interview. "It's clear that basically we had a war for eight years that was going on, that's adrift, that we're beginning at scratch, just at the starting point ... and that there's not a security force, an army, and the types of services that are important for the Afghans to become a true partner," Emanuel said. Echoing comments from Sen. John Kerry, D-Massachusetts, Emanuel said it would be "reckless to make a decision on U.S. troop levels if, in fact, you haven't done a thorough analysis of whether, in fact, there's an Afghan partner ready to fill that space that the U.S. troops would create." In a separate interview with CNN, Kerry -- a war veteran who is on a trip to Afghanistan -- said, "Before the president makes a decision about the numbers of troops that ought to come here, I believe it is critical for us to be satisfied that the reform efforts that are absolutely mandatory within the government here are in fact going to take place and be fully implemented." Kerry also spoke to CBS' "Face the Nation." In that interview he called for "changes in the kind of counterinsurgency strategy we are pursuing." "This is not Iraq," he said, calling it a "very different challenge." Success in Afghanistan will not be defined by military objectives, Kerry said. "There is no military success ultimately to Afghanistan." Emanuel told CNN the U.S. effort requires getting answers to a "set of questions that have to have answers, that have never been asked." Obama "will not be rushed to making a decision without asking firm questions and challenging the assumptions," he said. With the results of recent presidential elections in Afghanistan still unclear because of concerns about fraud, Emanuel said there are two options: a runoff between the two top candidates or a negotiation. The end result must be "a legitimate and credible" government that the Afghan people view as valid, Emanuel said. CNN's Martina Stewart contributed to this report.